Powers/Abilities: Billy was bigger than the Hulk and was incredibly strong; he was very intelligent in spite of his early age. (Incredible Hulk II#222 (fb)) - Billy and his family lived on a beautiful farm. When Billy was less than 1 year old, his family took him to a picnic. After a while when nobody was watching him, he crawled on all fours and drank a liquid from a cylinder full of radioactive wastes. (Incredible Hulk II#222 (fb)) - Billy was hospitalized for several weeks, the wastes infected him and the doctors declared he would never be normal. Billy was taken back home. (Incredible Hulk II#222 (fb)) - Billy grew at an accelerated rate. His intelligence grew, also. His parents were scared of him. His skin became darker and blue. (Incredible Hulk II#222 (fb) - BTS) - One day, Billy killed and ate half of Esmeralda, one of the cows on the farm. Afterwards, Billy killed and ate the bull of Mrs. Toynbee. Other animals were killed by Billy. (Incredible Hulk II#222 (fb) - BTS) - Three weeks later, a vagabond was killed by Billy, near his house. (Incredible Hulk II#222 (fb)) - The following evening, Billy killed Daisy, the family dog. While he was playing with its dead body parts, he was spotted by his father. (Incredible Hulk II#222 (fb) - BTS) - That night, Billy killed his father and his mother (he probably figured out that his freedom was in danger, and ate them). (Incredible Hulk II#222 (fb)) - The day after, he convinced his two siblings that their parents had gone away and they would never came back, and that he would have to take care of them. At this point Billy was far bigger than a normal man. The day after, the sheriff went to find Billy's family, but Billy hid himself and his siblings and the day after convinced his brother and sister to go away. They went to live in a hut near a cavern on the Adirondack Mountains. Billy took care of his brother and sister, and Donny and Marie found some "friends" with whom Billy could play with when they were sleeping. (Incredible Hulk II#222 (fb)) - Billy killed and ate some people (probably his "friends"). (Incredible Hulk I#222) - One day, Donny and Marie found another friend for Billy. 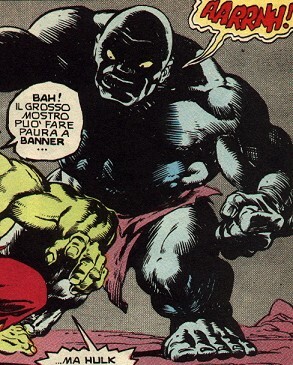 (Incredible Hulk II#222 - BTS) - Billy found his new friend sleeping, and carried him away to his cavern. That friend was the Hulk. While sleeping in the cavern, Hulk transformed into Bruce Banner. (Incredible Hulk I#222) - Staying in the shadows, Billy looked at Donny and Marie talking to Bruce Banner about his story. 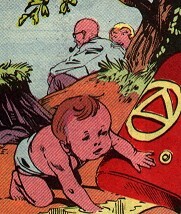 When Billy was hungry, he sounded a gong, the signal for the children to go to sleep, and they did, leaving Banner alone. Billy came out from the shadows and tried to grab Banner, but fear made Banner transform into the Hulk. A fight started between the two monsters. 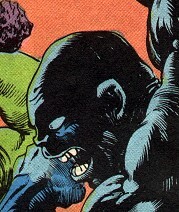 Billy made headway against the Hulk but their powerful blows caused the cavern to collapse above them. Only the Hulk had the strength to make it out from underneath the rocks. Comments: Created by Len Wein, Jim Starlin and Alfredo Alcala. The children said that Billy talked to them about their parents and about hiding themselves, but when Billy fought the Hulk he pronounced only bestial grunts. Also, I wonder if their last name was Osmond? any other "Monster" or "Monstrous" character. Billy's family lived on a prosperous farm where they bred cows, hens and so on. Billy was the younger brother, he had two siblings, Donny and Marie. Their life changed after the accident occured to Billy. Billy was hospitalized, but the radioactivity changed him into a monster. His mother was scared, and also his Father was afraid of him. Only his siblings didn't worry about him, he was only... different and shy. One day, Billy's father found one of his cows dead, devoured by something or somebody, and figured out that Billy was the perpetrator. He surrounded his property with barbed wire, but Billy killed other animals. When Billy's father saw a vagabond killed in the same manner as the animals, he was horrified, and that evening spotted Billy while was eating their dog, so he talked to his wife (probably they understood that Billy was truly dangerous). But that night they were killed by Billy. One day, the two children saw the Hulk while he was trying to avoid the U.S. Army, and, seeing his size, thought that he would have been a perfect friend for Billy. So, when the Hulk fainted from the soporific gas, Marie called Billy, and they brought Hulk to the cavern. There, the children were surprised that the big friend for Billy trasformed in such a slim friend, but they took a liking to him and told him their story. However, when they heard the gong, they left Banner alone.